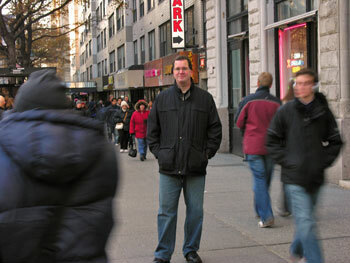 Jazz guitarist Pete McCann has been an integral part of the New York City scene for over 15 years. He currently leads an exciting new group of New York's finest jazz artists on his latest CD, Most Folks, on OmniTone. His first two CDs, Parable and You Remind Me of Someone, were released by Palmetto Records and were widely praised by top jazz critics. McCann is one of the first-call sidemen in New York. He works in several groups including the John McNeil Quartet, New York Nonet, Dan Willis Sextet, Chris Tarry Group and the Heather Bennett Quintet. Pete has performed with some of the greats in jazz: Kenny Wheeler, Dave Liebman, Kenny Garrett, Peter Erskine, Gary Thomas, Greg Osby, Brian Blade, and the Maria Schneider Orchestra. He has appeared on over 45 CDs including: I Think It's Going to Rain Today, Curtis Stigers; The Other Side of Ellington, the Palmetto All-Stars; Standard Wonder (The Music Of Stevie Wonder), Dave Pietro; Round 'Bout Now, George Schuller; and Phase 2, Mahavishnu Project. Pete's playing encompasses a wide variety of musical styles and genres —	straight–ahead, Post-Bop, Avant-Garde, Latin, Jazz-Rock Fusion. He has performed throughout the US, Canada and Europe from clubs to jazz festivals, musicals, award shows, and even an opera. McCann received the Ed Casias Memorial Scholarship for three years while attending the University of North Texas. There, he graduated with a Bachelor of Music degree. Among Pete's instructors was jazz guitar pedagogue Jack Petersen. In 1988, he attended the Banff Summer Jazz Workshop in Alberta, Canada, where he studied with Dave Holland, Kenny Wheeler, Muhal Richard Abrams, Kevin Eubanks and others. Pete teaches guitar at The New School and City College in New York City. He is a native of Eau Claire, Wisconsin and lives with his wife and two sons in New Jersey.